We all hear about how exercise improves heart health, but how exactly does that happen? Let’s take a look at why exercise is so good for your heart, and what you can do to maximize the benefits of cardiovascular workouts. Aerobic, or cardio, exercise is one of the cornerstones of fitness. The reason that exercising in a way that gets your heart rate up over a sustained amount of time is so good is three-fold. First, cardio exercise strengthens the heart. Like any muscle, the heart can increase in strength the more you use it. This helps you to pump blood through your body more efficiently. In turn, this increases oxygen flow to other parts of the body, and improves the functioning of the blood vessels. (Couple exercise with this One Nutrient that strengthens your heart) Finally, increased cardio exercise can lower blood pressure as the heart muscle becomes more efficient, while also promoting weight loss. The American Heart Association recommends half an hour of exercise with an elevated heart rate per day. That said, you may not necessarily have time to fit in a complete workout every day. If you struggle to find time for exercise, try fitting in multiple 5-10 minute small exercises, like walking or yoga. In any event, it’s a good idea to start any intense workout with a brief warm up and cool down at the end for maximum benefit and safety. If you’re new to cardio workouts, start off slowly and gradually ramp up the intensity as your fitness increases. Looking for more information? Check out this infographic highlighting the impact of cardio exercise on your heart. What is your favorite kind of cardio workout? 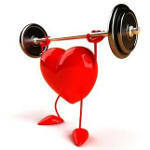 Latest Headlines » Fitness » Do You Know Why Exercise Helps Your Heart?